The notion of human security is the result of an attempt to conceptualise new understandings and practices of security that are alternative to the realist thought. This search for a new security notion views the nation states are unable to provide security for people. However, this claim does not prevent usage of this concept as a foreign policy instrument in the conventional sense. In this context, Critical Theory, another alternative approach to Realism, helps to evaluate the human security in such a critical manner. This article firstly deals with the issue of security with a special focus on the developments in security studies after the end of the Cold War. In this sense, the main differences of realist and critical notions of security will be compared and the basic premises of HS will be highlighted. Secondly, CT, which is another alternative paradigm to realism in security studies, will be discussed in relation with HS. Finally, with the help of CT, it will be argued that how HS can be used as leverage for conventional foreign policy goals. In order to evaluate to what extent content this is true, this paper will focus on the EU’s response to the Syrian Refugee Crisis. The directives and actions in response to the refugee crisis will be analysed in order to answer the question of whether a Human Security approach could be a viable model for the EU in international relations. Amnesty International (2016) European Commission asylum reforms must lead to genuine responsibility-sharing. [ONLINE] Available at: https://www.amnesty.org.uk/press-releases/european-commission-asylum-reforms-must-lead-genuine-responsibility-sharing [Accessed 05/05/2016] Bostanoğlu B. and Okur, M. A. (2009) Uluslararası İlişkilerde Eleştirel Kuram [Critical Theory in International Relations]. Ankara: İmge.Buzan, B. (1991) People, States and Fear: An Agenda for International Security Studies in the Post-Cold War Era. (2nd ed.) Boulder: CO, Lynne Rienner.Carrera, S., Blockmans, S., Gros, D. and Guild, E. (2015) The EU’s Response to the Refu-gee Crisis: Taking Stock and Setting Policy Priorities. Centre for European Policy Studies. Brussels. Chandler, D. (2008) Human Security: The Dog That Didn’t Bark. Security Dia-logue, 39(4): 427-438.Commission on Human Security. (2003) Human Security Now. New York.Cox, R.W. (1999) Civil Society at the Turn of the Millenium: Prospects for An Alternative World Order. Review of International Studies, 25(1): 3-28.Cox, R.W. (1981) Social Forces, States and World Orders: Beyond International Theory. Millenium: Journal of International Studies, 10(2): 126-55. Cox, R.W. (2001) The Way Ahead: Toward a New Ontology of World Order. In R.W. Jones (ed.) Critical Theory & World Politics. Colorado: Lyenner Rienner.Duffield, M. and Waddell N. (2006) Securing Humans in a Dangerous World. International Politics, 43(1): 1-23.Eralp, A. (2005) Hegemonya [Hegemony]. In: A. Eralp (ed.) Devlet ve Ötesi [State and Be-yond]. İstanbul: İletişim.European Commission (2015) Refugee Crisis: European Commission reports on progress in implementation of priority actions. [ONLINE] Available at: http://europa.eu/rapid/press-release_IP-15-5839_en.htm Press Release. Brussels [Accessed 28/04/2016]European Commission (2016) Communication from the Commission to the European Par-liament and the Council: Towards a Reform of the Common European Asylum System and Enhancing Legal Avenues to Europe. [ONLINE] Available at: http://ec.europa.eu/dgs/home-affairs/what-we-do/policies/european-agenda-migration/proposal-implementation-pack-age/docs/20160406/towards_a_reform_of_the_common_european_asylum_system_and_enhancing_legal_avenues_to_europe_-_20160406_en.pdf Brussels [Accessed 04/05/2016]European Commission (2016a) Questions & Answers: Reforming the Common European Asylum System. [ONLINE] Available at: http://europa.eu/rapid/press-release_MEMO-16-1621_en.htm Brussels [Accessed 05/05/2016] European Council (2003) A Secure Europe in a Better World: European Security Strategy. [ONLINE] Available at: http://www.consilium.europa.eu/uedocs/cmsUpload/78367.pdf Brussels [Accessed 28/04/2016] Fakiolas, E. (2011) Human and National Security: a Relation of Contradiction or Common-ality? Southeast European and Black Sea Studies, 11(4): 369–384.Ferrero-Waldner, B., (2006) Human Security and Aid Effectiveness: The EU’s Challenges. Speech by the European Commissioner for External Relations and European Neighbour-hood Policy addressing United Nations, New York. Grayson, K. (2009) Critical Perspectives on Human Security, International Studies Review, 11(3): 626–628.Inglehart, R. and Norris, P. (2012) The Four Horsemen of the Apocalypse: Understanding Human Security. Scandinavian Political Studies, 35(1): 71–96. Kaldor, M. et al (2004) A Human Security Doctrine for Europe: The Barcelona Report of the Study Group on Europe’s Security Capabilities. Kaldor, M. et al (2007) A European Way of Security: The Madrid Report of the Human Se-curity Study Group comprising a Proposal and Background Report.Kaldor, M. et al (2007) Human security: a new strategic narrative for Europe. International Affairs, 83(2): 273–288. Lacher, H. (2006) Beyond Globalization, Capitalism, Territoriality, and the International Relations of Modernity. London: Routledge.Lasswell, H.D. (1936) Politics: Who Gets What, When, How. New York: House.Linklater, A. (1990) Beyond Realism and Marxism: Critical Theory and International Rela-tions. London: Macmillan.Linklater, A. (2001) Theories of International Relations. London: Palgrave.Maclean, S. et al (2006) A Decade of Human Security: Global Governance and New Multi-lateralisms. Burlington: Ashgate Publishing.Newman E. Human Security, http://www.isacompss.com/info/samples/humansecurity_sample.pdf, accessed 21 April 2016.Newman, E. (2010) Critical Human Security Studies. Review of International Studies, 36(1): 77-94. Peterson, J. (2013) Creating Space for Emancipatory Human Security: Liberal Obstructions and the Potential of Agonism. International Studies Quarterly, 57(2): 318-328.Shani, G. et al (2007) Protecting Human Security in a Post 9⁄11 World: Critical and Global Insights. New York: Palgrave MacMillan.Trager, F. and Philip S. Kronenberg (eds.) (1973) National Security and American Society. Lawrence: The University Press of Kansas.UNDP (1994), Human Development Report. New York: Oxford University Press. ISNAD Baysoy, Emre . "HUMAN SECURITY FROM THE CRITICAL THEORY PERSPECTIVE: EU AND THE REFUGEE CRISIS". 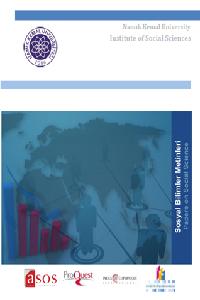 Sosyal Bilimler Metinleri 2018 / 2 (October 2018): 16-24.